Catholic Bible 101 - What is Grace? "Amazing Grace, so sweet the sound, that saved a wretch like me! I once was lost but now am found, Was blind, but now, I see. Through many dangers, toils and snares we have already come. T'was Grace that brought us safe thus far and Grace will lead us home. The Lord has promised good to me His word my hope secures. He will my shield and portion be as long as life endures. Yea, when this flesh and heart shall fail, and mortal life shall cease, I shall possess within the veil, a life of joy and peace. When we've been here ten thousand years bright shining as the sun. We've no less days to sing God's praise then when we've first begun." So what is grace, and how do we get more of it? We are very lucky in the Catholic Church because our priests dispense sanctifying grace each and every day to the faithful in the sacraments, especially Holy Communion and Confession. In this very busy and lustful world that we live in today, there is a need for more and more grace in our lives if we want to overcome the evil one and get to heaven. Grace is an absolute necessity in our day-to-day activities. But how many people realize that? How many people live out their existence and never even once ask God to send more grace? #162: Faith is an entirely free gift that God makes to man. #166: "Faith is a personal act - the free response of the human person to the initiative of God who reveals himself." "And to keep me from being too elated by the abundance of revelations, a thorn was given me in the flesh, a messenger of Satan, to harass me, to keep me from being too elated. Three times I besought the Lord about this, that it should leave me; but he said to me, "My grace is sufficient for you, for my power is made perfect in weakness." I will all the more gladly boast of my weaknesses, that the power of Christ may rest upon me. For the sake of Christ, then, I am content with weaknesses, insults, hardships, persecutions, and calamities; for when I am weak, then I am strong." From the above statement of Paul, we see that God gives each one us sufficient grace to overcome sin, even when it seems like we are struggling with overcoming sin. And when we are the weakest, that is when we are the strongest, because that's when God's power is made perfect in us. How many people, when things get so bad in their lives, fall down on their knees in tears and ask God to fix things? A lot, and that is exactly what God means when he says "my power is made perfect in weakness." The acknowledgment of God as our loving Father over our own strength and power is the beginning of our relationship with God, and the beginning of the end of our pride. The prideful and strong who are always in charge of their affairs never do this, so God can't work in them as powerfully as someone who is humble and acknowledges God in their distress. Sirach 37:21: for grace was not given him by the Lord, since he is lacking in all wisdom. Acts 15:11: But we believe that we shall be saved through the grace of the Lord Jesus, just as they will." Romans 5:20-21: Law came in, to increase the trespass; but where sin increased, grace abounded all the more, so that, as sin reigned in death, grace also might reign through righteousness to eternal life through Jesus Christ our Lord. (**NOTE - If you are leading a very sinful life, from the above verse, know without a doubt that God your loving Father is sending you even more grace to overcome your sinful lifestyle. All you have to do is to accept it through humility and prayer). (**NOTE - Very true for all of us, but especially true for the Blessed Virgin Mary, who IS full of grace). 1 Corinthians 15:10: But by the grace of God I am what I am, and his grace toward me was not in vain. On the contrary, I worked harder than any of them, though it was not I, but the grace of God which is with me. 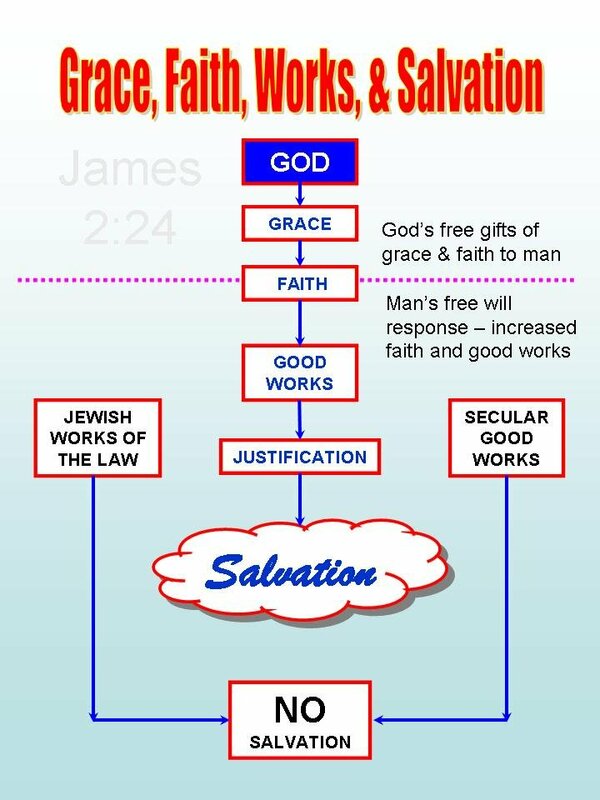 (**NOTE - Grace increases our faith, which in turn spurs us on to bear good fruit, our good works done out of love for Jesus Christ - Faith without works is dead - James 2:26). Ephesians 4:7: But grace was given to each of us according to the measure of Christ's gift. (**NOTE - This is why one cannot receive Jesus in Holy Communion if in the state of mortal sin. The power of the sacraments, while infinite, are proportional in their efficacy to the holiness of the person receiving them. 1996 Our justification comes from the grace of God. Grace is favor, the free and undeserved help that God gives us to respond to his call to become children of God, adoptive sons, partakers of the divine nature and of eternal life. 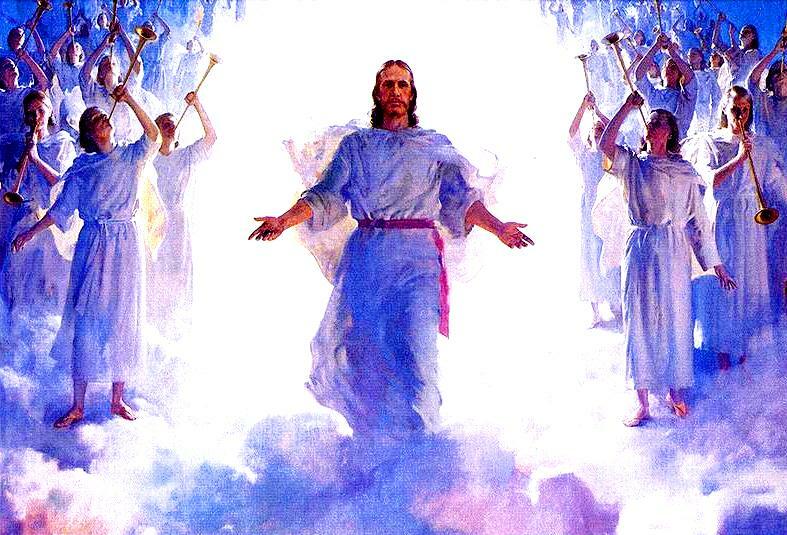 1998 This vocation to eternal life is supernatural. It depends entirely on God's gratuitous initiative, for he alone can reveal and give himself. It surpasses the power of human intellect and will, as that of every other creature. Therefore if any one is in Christ, he is a new creation; the old has passed away, behold, the new has come. All this is from God, who through Christ reconciled us to himself. Indeed we also work, but we are only collaborating with God who works, for his mercy has gone before us. It has gone before us so that we may be healed, and follows us so that once healed, we may be given life; it goes before us so that we may be called, and follows us so that we may be glorified; it goes before us so that we may live devoutly, and follows us so that we may always live with God: for without him we can do nothing. If at the end of your very good works . . ., you rested on the seventh day, it was to foretell by the voice of your book that at the end of our works, which are indeed "very good" since you have given them to us, we shall also rest in you on the sabbath of eternal life. 2003 Grace is first and foremost the gift of the Spirit who justifies and sanctifies us. But grace also includes the gifts that the Spirit grants us to associate us with his work, to enable us to collaborate in the salvation of others and in the growth of the Body of Christ, the Church. There are sacramental graces, gifts proper to the different sacraments. There are furthermore special graces, also called charisms after the Greek term used by St. Paul and meaning "favor," "gratuitous gift," "benefit." Whatever their character - sometimes it is extraordinary, such as the gift of miracles or of tongues - charisms are oriented toward sanctifying grace and are intended for the common good of the Church. They are at the service of charity which builds up the Church. 2005 Since it belongs to the supernatural order, grace escapes our experience and cannot be known except by faith. We cannot therefore rely on our feelings or our works to conclude that we are justified and saved. However, according to the Lord's words "Thus you will know them by their fruits" - reflection on God's blessings in our life and in the lives of the saints offers us a guarantee that grace is at work in us and spurs us on to an ever greater faith and an attitude of trustful poverty. 1127 Celebrated worthily in faith, the sacraments confer the grace that they signify. They are efficacious because in them Christ himself is at work: it is he who baptizes, he who acts in his sacraments in order to communicate the grace that each sacrament signifies. The Father always hears the prayer of his Son's Church which, in the epiclesis of each sacrament, expresses her faith in the power of the Spirit. As fire transforms into itself everything it touches, so the Holy Spirit transforms into the divine life whatever is subjected to his power. 1128 This is the meaning of the Church's affirmation that the sacraments act ex opere operato (literally: "by the very fact of the action's being performed"), i.e., by virtue of the saving work of Christ, accomplished once for all. It follows that "the sacrament is not wrought by the righteousness of either the celebrant or the recipient, but by the power of God." From the moment that a sacrament is celebrated in accordance with the intention of the Church, the power of Christ and his Spirit acts in and through it, independently of the personal holiness of the minister. Nevertheless, the fruits of the sacraments also depend on the disposition of the one who receives them. 1129 The Church affirms that for believers the sacraments of the New Covenant are necessary for salvation. "Sacramental grace" is the grace of the Holy Spirit, given by Christ and proper to each sacrament. The Spirit heals and transforms those who receive him by conforming them to the Son of God. The fruit of the sacramental life is that the Spirit of adoption makes the faithful partakers in the divine nature by uniting them in a living union with the only Son, the Savior.